Suitable 3 years old and up. Place all the felt food pieces in a row. With the child, count the number of pieces. Repeat until the child is able to count them independently. Ask the child to sort the toppings into groups by shape and category. Have the child identify each type of food and count how many there are in each group. Count how many toppings there are all together. 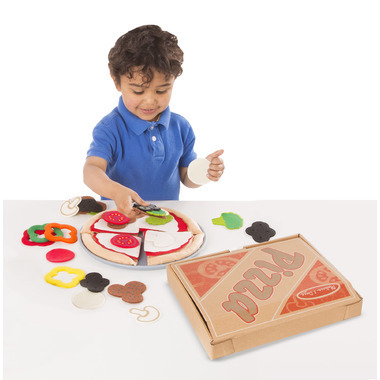 Play a matching game by creating a slice of pizza with a variety of toppings and ask the child to match your slice. Put all four slices of pizza on the pizza pan to introduce the word "whole." Demonstrate "half" the pizza by removing two slices and putting them on the table. Remove one or three slices to show one quarter or three quarters. Ask the child to make a sauce-and-cheese pizza with pepperoni and mushrooms. If the child is familiar with fractions, you might ask for half with one topping and half with another. Place more orders, with increasing numbers of ingredients. This is so much fun to play with. We are having tons of fun. Good quality too. 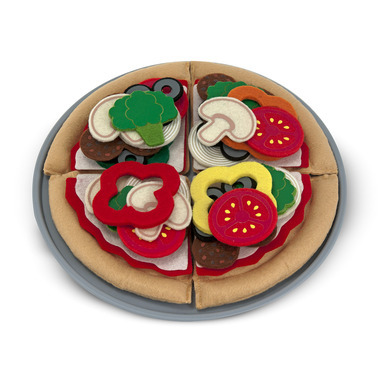 My 22 month old loves playing with this felt imitation pizza. We have a lot of fun with her making different slicers and "tasting" them! A great toy. Adorable! 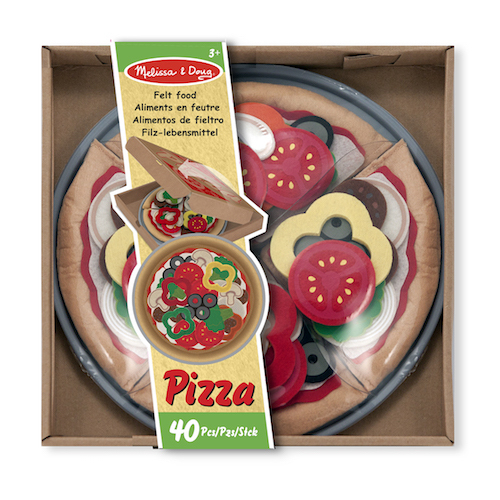 Love the variety of pizza toppings and the box it comes in turns into a "pizza delivery box" with lid! This is a great toy for play and learning math.